Large crossover SUVs have become the vehicle of choice for many large families. It's easy to see why, as these crossovers offer plenty of room inside for passengers and their belongings, as well as the availability of all-wheel drive to get them confidently to their destinations in foul weather conditions. Among these new-age station wagons, the 2014 Buick Enclave stands as a sensible choice, particularly if you want something that's upscale but still significantly less expensive than the full-on luxury crossovers from various European and Japanese automakers. Like its Chevrolet Traverse and GMC Acadia platform mates, the Buick Enclave offers a spacious cabin, a variety of seating configurations, a pleasant ride and sufficient V6 power. The Buick boasts fancier styling, however, as well as richer interior furnishings than its cousins. It also comes with more equipment, as all models feature amenities like xenon headlights, triple-zone automatic climate control and the IntelliLink touchscreen electronics interface (which includes smartphone app integration) as standard. Naturally, there are plenty of choices out there. Checking out the Enclave's aforementioned Chevy and GMC relatives is still a good idea, as you may like their styling or lower base prices. The Ford Flex, with its wagonlike styling and available turbocharged V6, is a funkier take on the same theme and definitely worth a test-drive, as is the more athletic-handling and nearly as spacious Mazda CX-9. And if you're willing to drop down a bit in size, higher-end rivals like the Acura MDX and Infiniti QX60 have even nicer interiors, advanced features, and in the case of the Infiniti, an available hybrid powertrain. The MDX, meanwhile, offers the best overall driving characteristics of any three-row SUV in this price range. 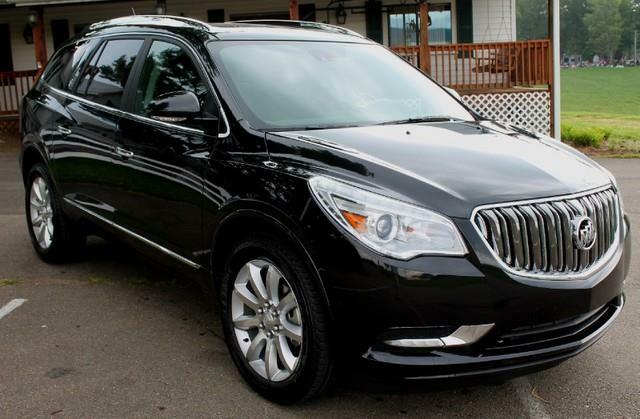 These are all worthy vehicles, but with its handsome styling, enormous cabin and competitive pricing, the 2014 Buick Enclave easily holds its own in the current population of family-friendly crossovers. The 2014 Buick Enclave is a full-size crossover that essentially comes in three trim levels that are referred to as groups: Convenience, Leather and Premium. Every 2014 Buick Enclave comes standard with a 3.6-liter V6 that produces 288 horsepower and 270 pound-feet of torque. A six-speed automatic transmission and front-wheel drive are standard, while all-wheel drive is an option. Properly equipped, the Enclave can tow 4,500 pounds. In Edmunds performance testing, an all-wheel-drive Enclave went from zero to 60 mph in 8.6 seconds, which is on par with other large crossovers with a base V6. EPA-estimated fuel economy stands at 19 mpg combined (17 city/24 highway) with front-wheel drive and 18 combined (16 city/22 highway) with all-wheel drive. Every 2014 Enclave includes antilock brakes, stability and traction control, front outboard side airbags, full-length side curtain airbags and a rearview camera. Also standard is a large airbag that deploys between the front seats in the event of a side impact. The standard OnStar system includes automatic crash notification, on-demand roadside assistance, an emergency button, stolen vehicle locator and active intervention, and remote door unlock. Rear parking sensors are standard on all versions. The Leather and Premium Groups include a blind-spot warning system and a cross-traffic back-up warning system. The Premium Group also includes forward collision alert and lane departure warning systems. The latter two are optional on the Leather Group. In government crash tests, the Enclave earned a top five-star rating for overall performance, with five stars being given for total front-impact protection and five stars for total side-impact protection. The Enclave also aced the Insurance Institute for Highway Safety crash tests, where it earned the highest rating of "Good" in moderate-overlap frontal-offset, side-impact and roof-strength tests. The Buick Enclave interior exists in a realm between regular- and luxury-branded crossovers. Materials are attractive and of good quality. We particularly like the padded vinyl trim on the dashboard: Thanks to contrasting stitching, it looks like real leather and contributes to the Buick's classy ambience. The climate controls are operated by three easy-to-use knobs, while every Enclave features Buick's IntelliLink 6.5-inch touchscreen display. IntelliLink allows smartphone radio app integration, and features a clean layout and intuitive menu structure. The screen itself is mounted low in the driver's sight line, however, and requires a longer glance away from the road than we'd like. In addition, the system is sometimes slow to respond to touch inputs (and occasionally misses them entirely), making the interface a bit frustrating. As for more practical matters, the Enclave (along with its GM cousins) is one of the most spacious crossovers available for both people and cargo. Front-row passengers will enjoy abundant head- and legroom, as will second-row occupants. But the middle-row seat cushions are mounted a bit low, which impacts comfort for adults. Sliding those seats all the way back helps alleviate this issue, but doing so effectively kills third-row legroom. The narrow, flat-cushioned third-row seats are easily deployed and stowed, though they're really only suited for kids and smaller adults. Some competitors, such as the Ford Flex, are a bit better in this regard. As is invariably the case with three-row vehicles, rearward visibility is almost nonexistent when you have a full crew onboard, so the standard rearview camera is a huge help. The Enclave bests all of its competitors when it comes to cargo capacity, though. Even with the third-row seats in place, it can carry up to 23.3 cubic feet of luggage. That figure jumps to 68.9 behind the second row and a cavernous 116.3 cubes with the second- and third-row seats stowed. The 2014 Buick Enclave weighs close to 5,000 pounds with all-wheel drive, so it's not exactly light on its feet. The V6 engine provides adequate performance but lacks punch during authoritative passing maneuvers. In addition, the automatic transmission can be slow to react when a quick downshift is needed, though its gearchanges are at least smooth. On the highway, the Enclave is well suited to transporting people and cargo in abundance thanks to its smooth ride and low levels of wind and road noise. Driven around turns, this big crossover SUV still feels reasonably secure and planted, but it's by no means sporty. If you're looking for a crossover that's a bit more engaging to drive, the CX-9, Flex and MDX are all good choices.